Richard Adams' novel Watership Down may feature a bunch of cute and cuddly rabbits, but the story is one of survival, loyalty, spirituality, and hardship. Fun! Actually, the book is one of the most beloved of the last century and has been adapted on a handful of occasions, with two major ones in 1978 and 1999. Now BBC and Netflix have teamed up for a 4-part miniseries with a star-studded voice cast and a budget of over $25M. So how did it turn out? 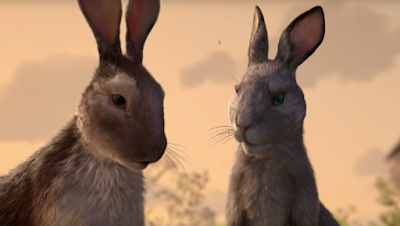 The first trailer for Watership Down sticks true to the book's themes of loyalty and faith. The largely allegorical tale follows a group of rabbits, led by Hazel and his seer brother Fiver, as they flee their home after a vision that it will be destroyed by humans. The hurdles they face are many, but they must stick together to build a better life for themselves and assure a future for their kind. Leading the voice cast are James McAvoy and Nicholas Hoult, along with John Boyega, Ben Kingsley, Gemma Arterton, Daniel Kaluuya, Olivia Colman, Peter Capaldi, Rosamund Pike, Taron Egerton, Gemma Chan, and Tom Wilkinson. But I have to say the animation is simply not that great. It looks like the computer animation for an educational series, not a major television work costing in the millions. The story and voice acting should go a long way, though. BBC will premiere Watership Down on December 22nd, with a Netflix run to follow.